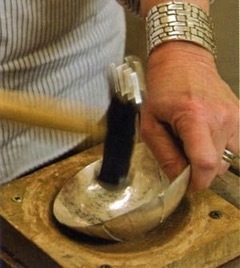 For more information, please check out my website, St. Vrain Metals, at tstvrain.com. I attended the University of Missouri, Columbia then moved to Santa Fe where I attended the Institute of American Indian Art. The Southwest, with its rich heritage, incredible quality of light, and beautiful landscape kept me there for 35 years! During this time, I was fortunate to learn from a variety of jewelers and metalsmiths; an education well worth the time spent with them. I have been crafting unique pieces of jewelry and metalwork for a number of years. My approach to the craft is one of fabricating each piece individually, focusing on work with clean lines and an aesthetic that does not rely on mass production techniques. This method allows me to revisit given pieces many times with an avid curiosity, revealing new aspects and furthering my ideas’ narrative with each endeavor. In this sense, each of the pieces is a one of a kind representation of my rich communication with the metals that I wield.